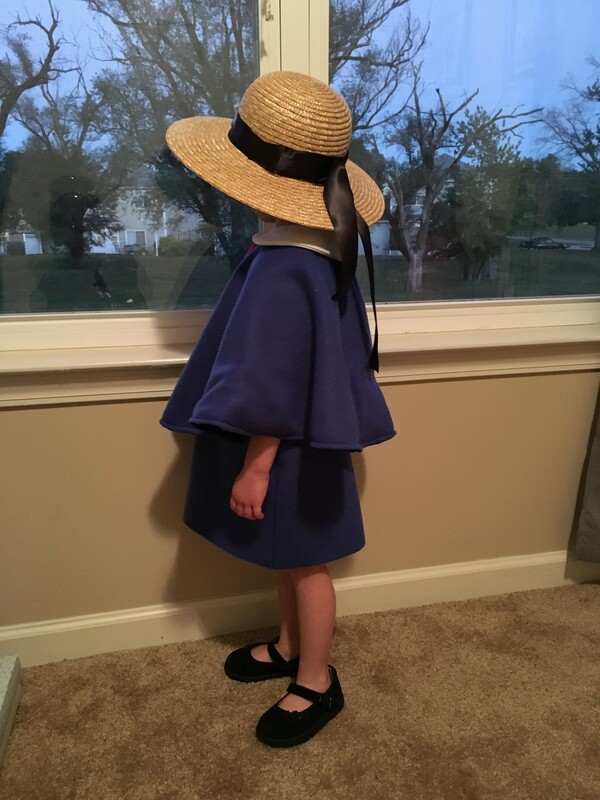 Making Maddie into Madeline: A Madeline Costume Tutorial! It took me a minute this year to come up with a meaningful Halloween costume idea. 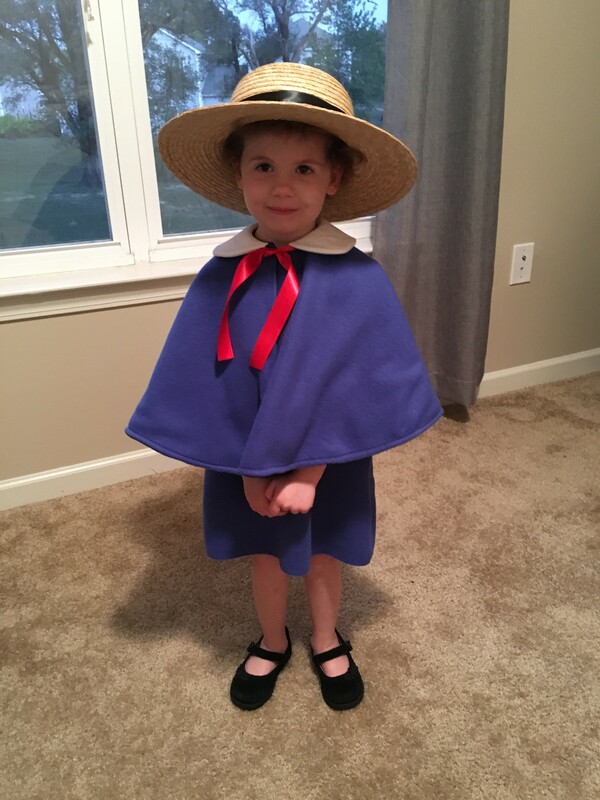 As she is already an opinionated three year old, this year will likely be the last that I am able to choose what Maddie dresses up as. I knew I needed to make it count. When the idea to make Madeline (Mad-uh-lynn) into Madeline (Mad-uh-line) from the storybooks came to me, I flew to Amazon and started searching for a costume. Turns out there is NOTHING out there. The closest I came was a very pricey cape on Etsy. I took a deep breath and started searching Pinterest for Madeline costumes, figuring there would be a tutorial among them. Pinterest never disappoints. 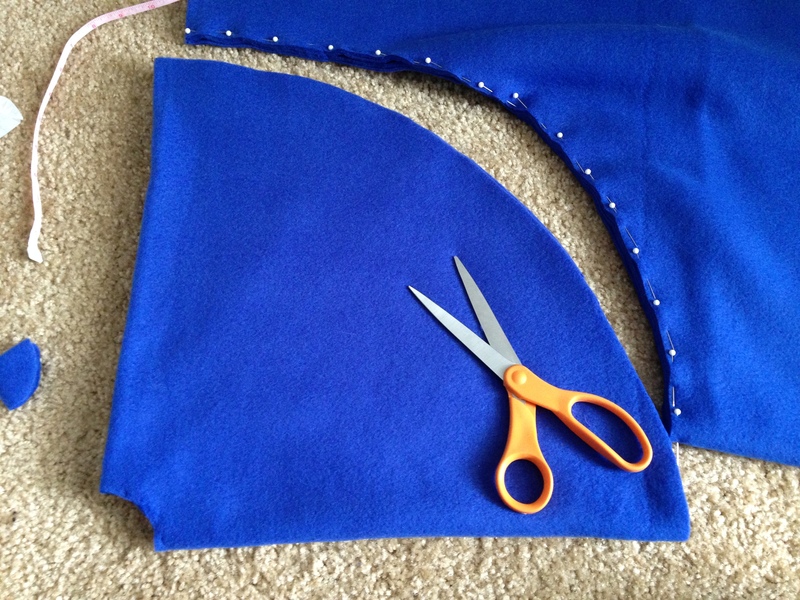 I found an amazing step-by-step plan for making a little girl’s cape, which I knew would be the perfect statement piece for her outfit. 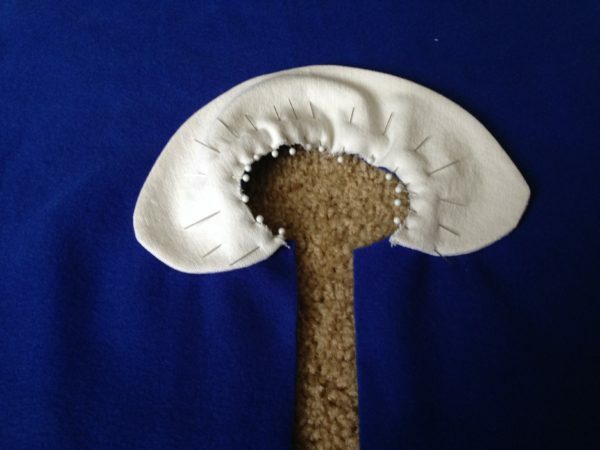 (For the actual instructions, I encourage you to visit Project Run and Play’s Audrey Cape Tutorial). After a quick romp in Joann’s, I was armed with blue fleece, black lining fabric, black and red ribbons and was ready to sew. Fleece folded, measured and marked with pins. I made a modified version of her “Little Girl Cape” with my neck hole measuring out two inches and the length measuring out 15. Cut out and ready to unfold. Liner folded, measured and marked with pins. Canvas bib collar cut-out and laid out, ready to be sewn. Collar pinned in place. You can never use too many pins in my oPINion. See what I did there? 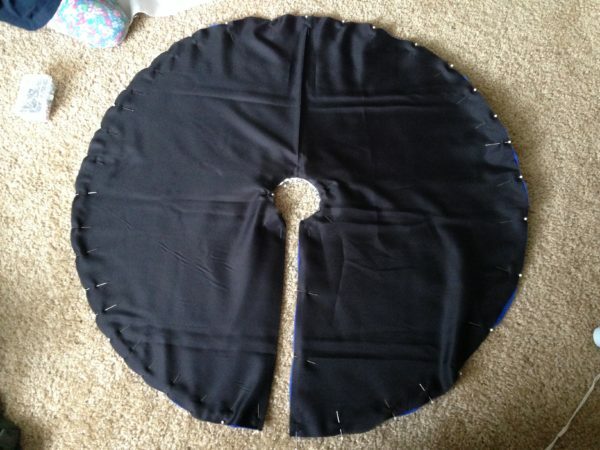 Lining pinned into place, right sides together, collar in the middle. And then I sewed my little heart out. I worked around the collar first, knowing it would take the most nerve and patience. Once I had successfully navigated that, the rest was gravy. 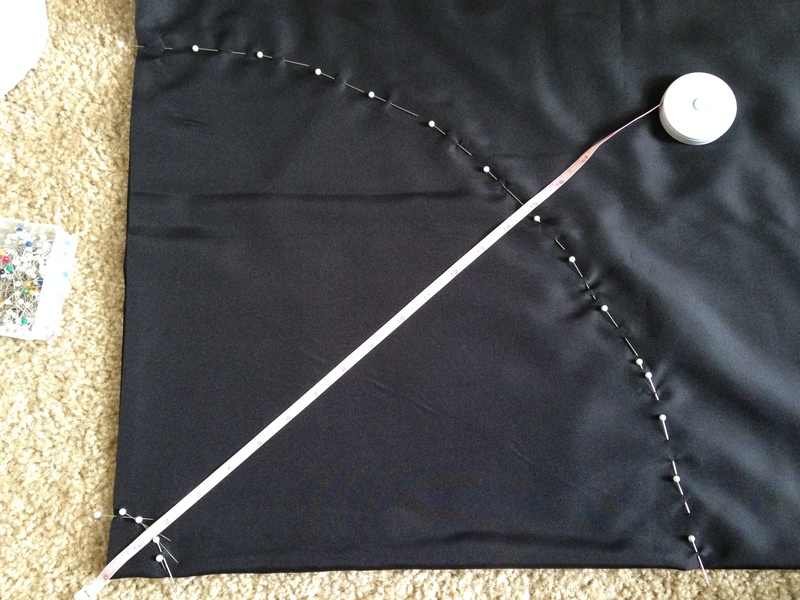 I even went so far as to top-stitch for a very polished look. I sewed a button and elastic fastener in place in the gap at the collar. And finally I tied a removable, red satin ribbon in the front, underneath the collar. With the cape finished, I decided, “If I can do that in one day, SURELY I can make a dress.” It would be my first dress (and maybe my last). I didn’t use a pattern, deciding to just wing it (always a solid idea). I laid one of Madeline’s jumpers on top of scrap fabric, traced the shape and cut out a template. 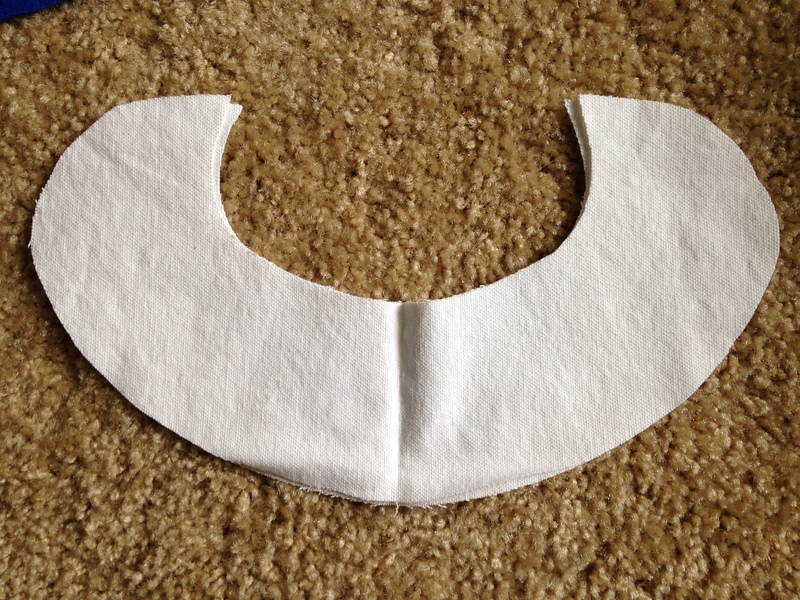 After I cut it out, I folded the template in half and trimmed a bit to make sure things were symmetrical. Then I laid it on top of my leftover fleece and cut the dress. I trimmed the collar on the front of a dress a little bit lower than the back, for aesthetics. 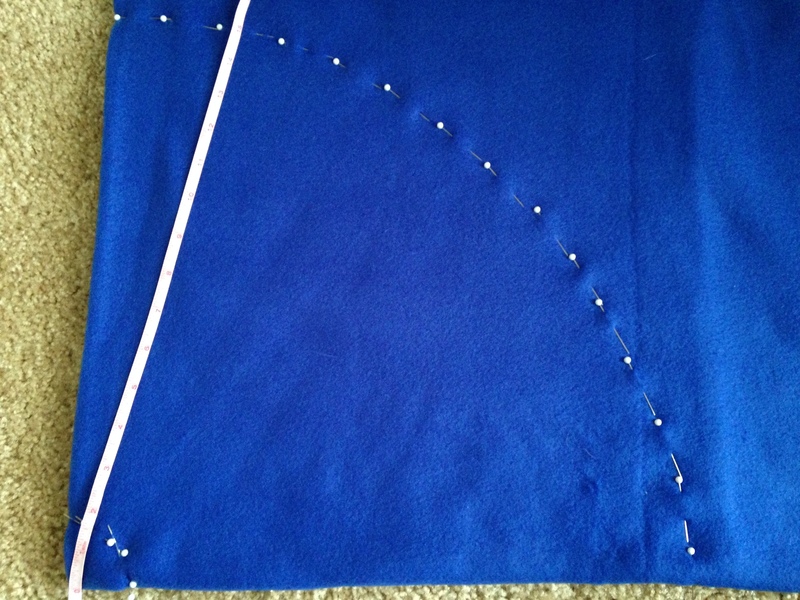 Then I turned the fabric right side in (which doesn’t seem to matter with fleece) and sewed. **DON’T be silly like me and sew the arm holes shut. I knew to leave the collar open, but for some reason I just zipped those arms right up like a potato sack and had to seam rip after realizing my mistake. 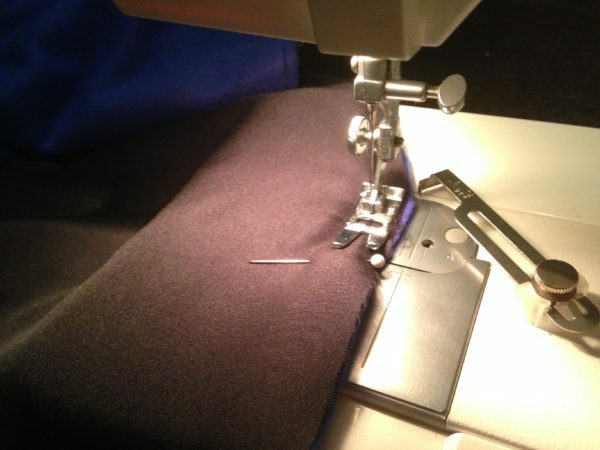 ** (Insert a broken sewing machine, a friend over to try to fix it and ultimately a trip to the sew shop to have it looked at, plus a new bobbin case installation here…because it can’t ever just be easy. In my best Tim Gunn voice: Make it work!) 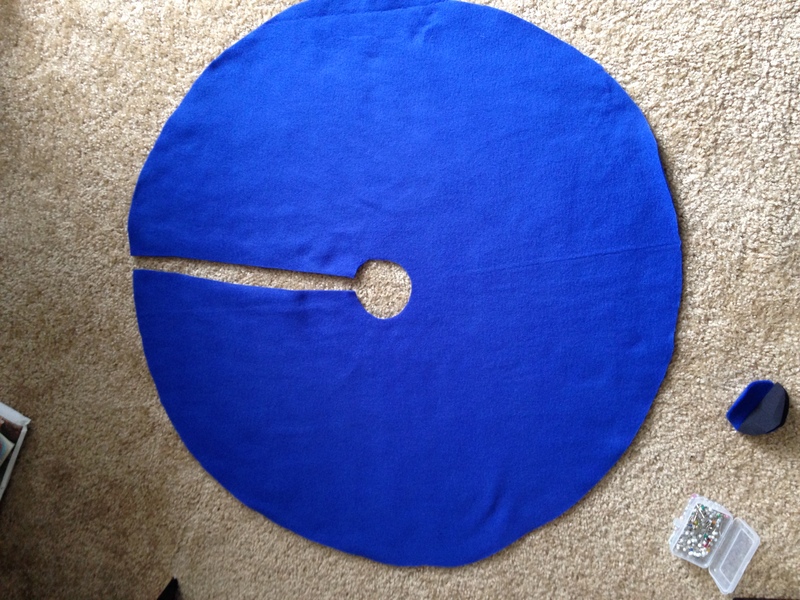 I top stitched the collar and arm holes to make it look more finished, but left the bottom straight, since fleece won’t fray and it was easier. I taped black satin ribbon onto Madeline’s old Easter bonnet and tied it in the back, letting the tails hang, for that fearless Madeline topper. After coming up short on Amazon (they only sell her size in packs of 12), I searched 10 different stores in the mall for white knee socks. Payless was the ONLY store that carried them, but they didn’t have her size (they do online). So ultimately we settled on white cable knit tights from H&M — more practical in her wardrobe for reuse anyway. And she’ll wear her black Mary Janes to complete the look. Time to get our tricks and treats on! 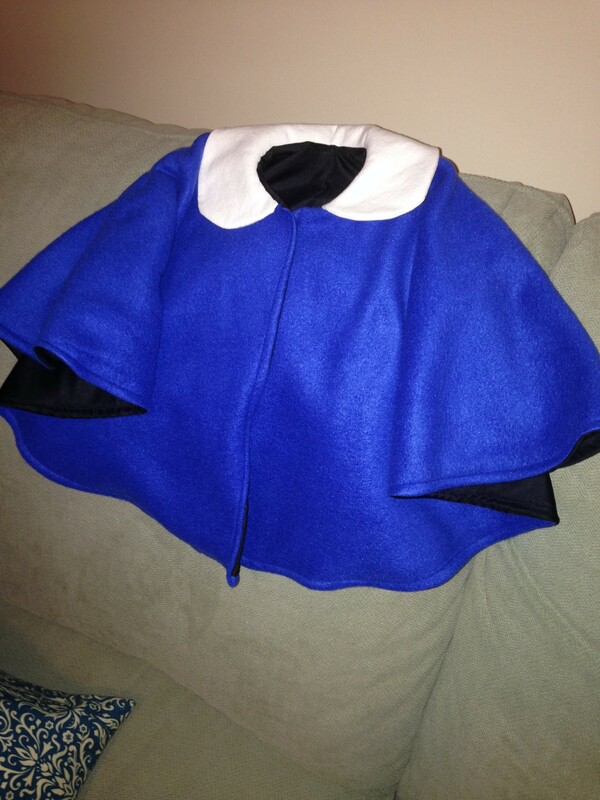 PS- Benjamin’s costume, while not homemade, is also literary and fantastically adorable. Can’t wait to show you! 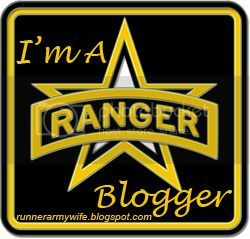 Can’t thank you enough for posting this! Not sure how to post photos but made this for my twin girls this year for Halloween and everyone loved it! Oh fabulous!! 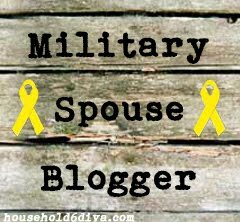 I’d love if you posted to the Keep Calm and Soldier on Facebook page or messaged me a snapshot there!! I’m dying to see your little Madelines!! This may be a stupid question but how many yards of fabric did you use? I sew maybe once every 2 years and I can never remember how to calculate it. I think I bought at most one yard of each fabric. This was a couple years ago, and I too am still a novice. I remember I had the woman in the fabric store help me figure out measurements! Can’t wait to see your finished product! Post pics!